Biochar is also a by-product of our torrefaction reactor technology and is excellent as a soil amendment for the agriculture industries. Biochar can help increase soil fertility, agricultural productivity, and protect against some soil-borne diseases, it may also help mitigate climate change by producing negative carbon dioxide emissions. By Clean Electricity Generation B.V. (CEG) based in Amsterdam, NETHERLANDS. Adaptation of conventional wood technology for agricultural residue. Partnership with TSI exclusively for agricultural residue applications. By American Biocarbon, LLC. based in White Castle, LOUISIANA (USA). Biocoal, or torrefied pellets, produced by Airex's CarbonFX system is a clean and readily available drop-in replacement for coal. BiocoalFX is a clean alternative to coal. Turning a coal-fired power plant into a 100% renewable energy plant. By Blackwood Technology based in WT Hoofddorp, NETHERLANDS. By ETIA based in Compiegne, FRANCE. 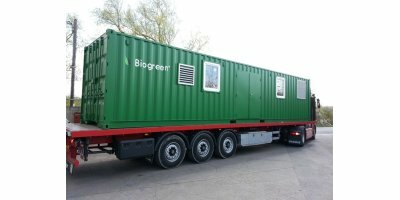 Equipment can be delivered in containerised modules that allow to present a quick and ready to use version of the Biogreen® process for thermochemical conversion. Unit can run in torrefaction, pyrolysis or high temperature pyrolysis mode to produce biochar, bio-oil and syngas from any kind of biomass waste from wood, crops or waste materials. By Bioendev AB based in Holmsund, SWEDEN. By TSI Inc. based in Lynnwood, WASHINGTON (USA). The CarbonFX process layout of the Bécancour plant is designed in a compact configuration for economic efficiency. The plant is strategically located for the efficient movement of goods by road, rail or sea, including easy access to biomass feedstock. Integration into sugar mill provides guaranteed supply of low cost feedstock. Adds economic benefit to farmers and sugar mills. Eliminated need for mills to manage bagasse residues. Feedstock supply is locked-in.